I keep my stringer in glassware, although it’s not the best storage solution. I think I’ll be changing it over soon. I was lucky enough to get a bunch of old wire test tube racks from my university days and I store all my tools on them. My crockpot full of vermiculite to cool beads down slowly. The little round thing next to it is a magnetic spice rack where reduction frit lives. The big batch annealing kiln is in the background. It’s huge and takes three people to lift it. 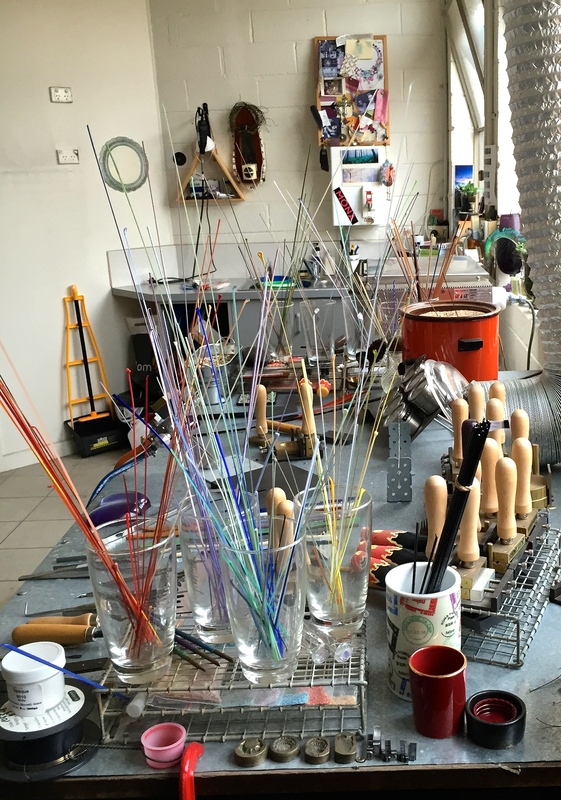 In Part 5 of the studio set up blogs I discussed bead release and mandrel preparation in exhaustive detail (I know I’m exhausted from proof reading it), but bead release is one of those things that if it’s going wrong can be most frustrating. This post turned into such a long-winded discussion about all the different tools and suppliers and what tool to get when, that I had to break it in two separate blog posts. 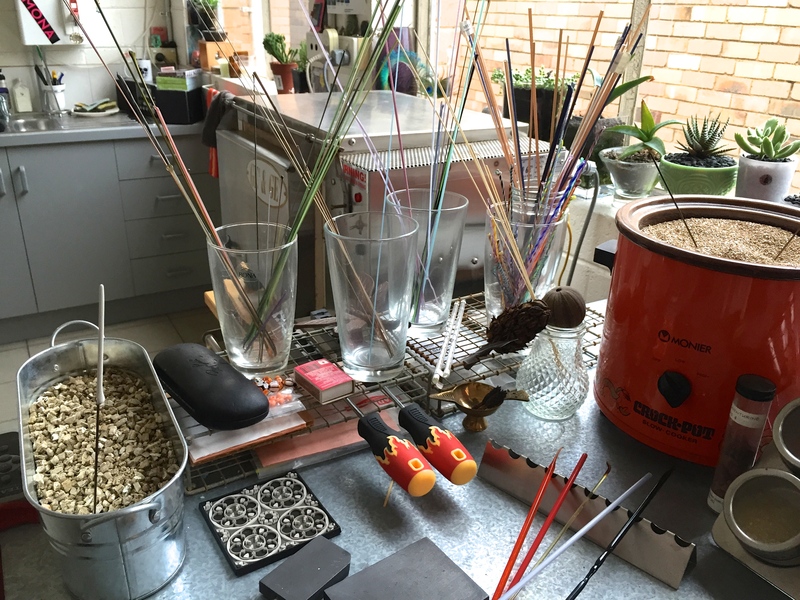 In the sixth installation of this blog series I tackle the discussion of what tools to buy on start up, very specifically, what tools to get within the first 60 hours of making beads. I have included a lot of links to different suppliers so that you can do some price comparing. In the first 60 hours I don’t think it is necessary to buy a kiln. Although I will talk about kilns in the next post on tools. At the end of this blog post is a list of tool manufacturers and suppliers for Australian residents. Most of my presses and tools were bought in 2007. I didn’t buy any tools for six years. Recently I’ve purchased a few tools second hand and new to inspire me to take my bead making in new directions. It was an overcast Sunday in 2006, I’d spent the entire day learning how to be ambidextrous, my left hand sometimes still doesn’t know what it wants to do. I had to learn how to spin a mandrel, apply glass, apply heat, use stringer, keep the bead round and well, none of that was working out right. I was exhausted and irritated with my slow progress. I couldn’t get the shapes I saw in my head to happen on my mandrel. A question by another student summed up my train of thought. “Should I use a press to get the shape that I want instead of making beads the slow way?” I listened eagerly to the answer and was at first disappointed. The teacher, Pauline Delaney paused for a moment and then said “later maybe, you should learn to get basic shapes with gravity and a marver first.” I can’t recall the conversation beyond that point, I was excited there were tools that could do the shaping for me and I was also busy feeling guilty about not wanting to follow teacher recommendations. The Jim Kervin and Corina Tettinger booklets that were instrumental in getting the lightbulb moment with heat control. 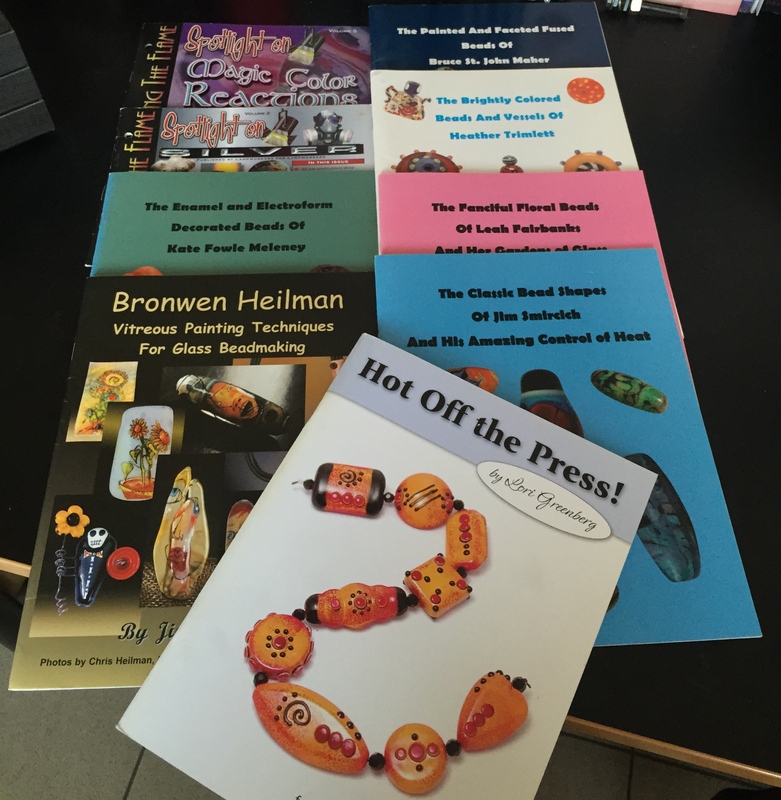 I bought Hot Off The Press by Lori Greenberg to learn how to use my presses properly, it ended up being a great book to help me understand shaping and forming beads using gravity. What I did in the next few weeks was to completely ignore Pauline’s advice and go on a tool-spending spree. Brass presses were really having their moment in the sun, and I was in love with all the fancy shapes I saw in beads for sale on eBay that were impossible to get (or truly difficult to achieve) with gravity and a marver. I went out and bought some Cattwalk presses; a lentil trio, a tile trio and a marquise shape. I’ve used the lentil the most (all my first lentils cracked). I used the smaller cavity in the tile trio once (turned out pretty well, but I never felt the urge to use it again) and the marquise shape once – in disgust I put the marquise press away because what I did make, exploded off the mandrel. I still have all my presses, and I’m slightly biased to the Cattwalk brand, all my presses bar one come from that company, but I realised that I wasn’t going to make anything better with a press until I figured out heat control and gravity forming beads. 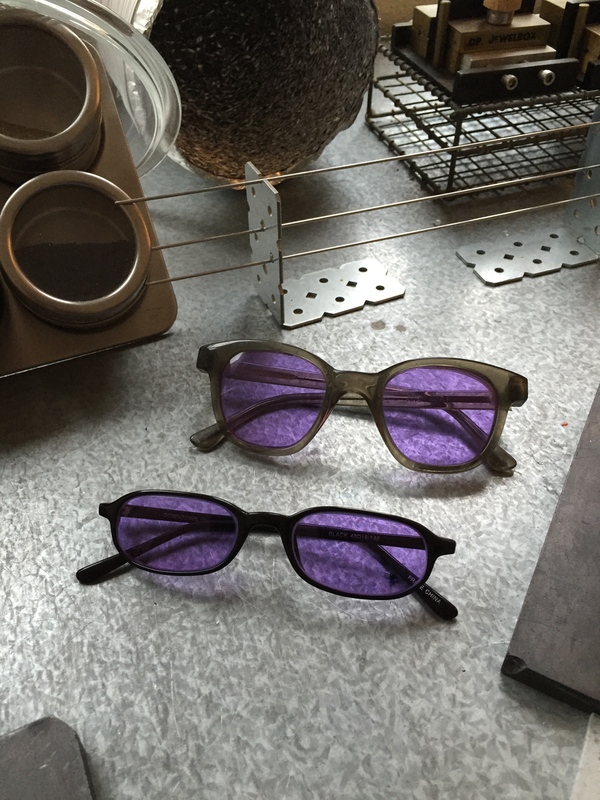 Foreground, ACE Didymium glasses, background regular Didymium glasses. The ACE glass is darker and supposedly offers better protection. If you don’t want to read the full and detailed list of tools below, here’s a quick version of what is recommended for a new lampworker to use in the first 30-60 hours of lampworking. If you like flat beads then get a pair of parallel mashers, although keeping a flat bead warm all over whilst doing a design on one surface is tricky, but as a beginner this is a great style to practice heat control on. Passing the Flame by Corina Tettinger is a bible of useful information, particularly from a decorating perspective. Making Glass Beads and Beads of Glass by Cindy Jenkins are useful for grasping basics. 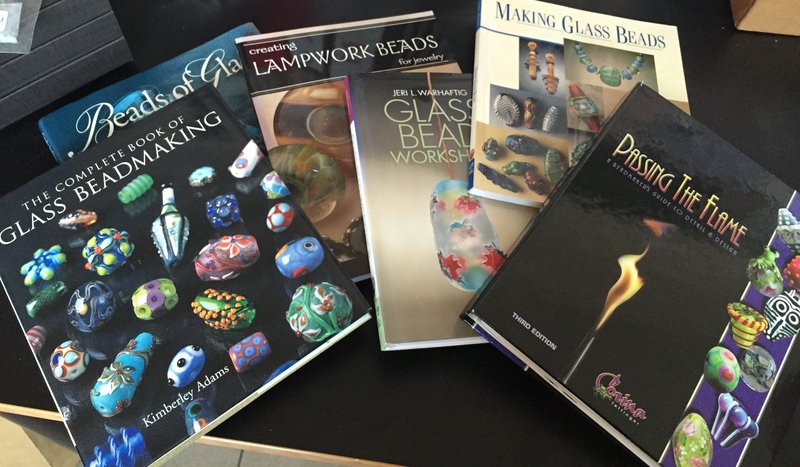 The complete book of Glass Beadmaking by Kimberly Adams is by far the most useful for heat and gravity shaped beads. Glass Bead Workshop by Jeri H. Warhaftig is well photographed and provided alternative ways to making beads I was already familiar with. Creating Lampwork Beads for Jewellery by Karen Leonardo is a gorgeous read and I bought it because I love her beads. I looked at my marvers and realised that using them was the only way I was going to learn heat control. So, back to marvering and gravity to shape beads. I couldn’t use presses until I understood and mastered the basic heating and manoeuvring of glass for myself. I made a lot of hollow beads to practice heat control. I shaped a lot of rounds and donuts, then figured out how to make tapered tubes, cylinders, barrels and bicones only using gravity and a marver. I got the hang of making a perfectly round bead (Larry Scott’s trick in Cindy Jenkin’s book Beads of Glass helped me “get it”). A lot of the beads I made with gravity and a marver cracked as well but I persevered and started reading more into heat control. I read Bhandu Dunham’s epic glass saga and got a greater understanding of the characteristics of molten glass. 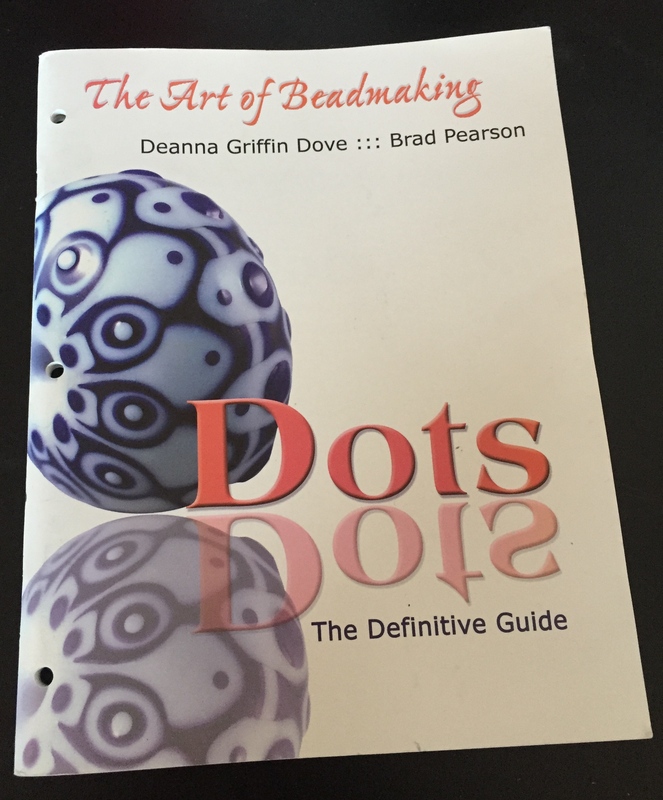 The Art of Beadmaking : Dots isn’t called the “definitive guide” for nothing! This one is a must have. I learned how to create perfect puckered ends, rounded ends and straight ends through Jim Kervin’s little books about Jim (James) Smirchich’s heat and gravity shaped beads. I learned how to get bicones and triangles and discs by reading about Heather Trimlett’s techniques, such as the “40 bead challenge”. I had a copy of Corina Tettinger’s book (bible) and it didn’t leave my side for the next six months. These artists use gravity and simple tools to get all the shapes they need, if it was good enough for the masters, it was good enough for me. Pauline is right, the information coming out in publications from the most influential teachers were all saying the same thing. Heat, gravity and a marver are the most essential tools for learning how to make beads. 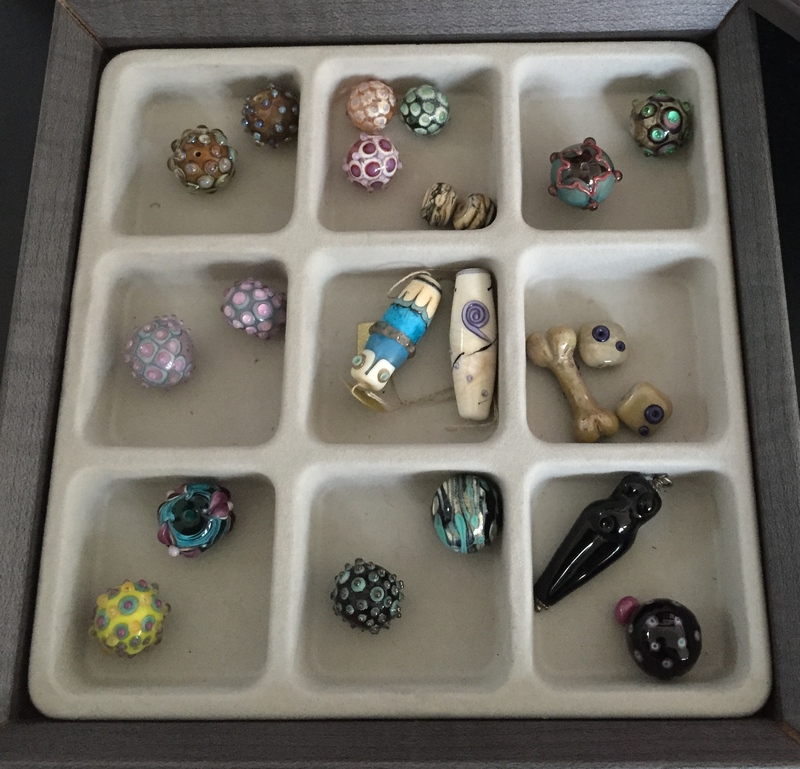 Assorted heat and gravity beads that I have made over the years and never got around to using or selling. If you learn how to heat glass and move it with gravity first then you will encounter fewer problems when using presses or making beads outside of your comfort zone (like, long flat beads or thin tubes). By the end of those thirty hours my heat control was better and my understanding of how glass moves was significantly increased. After six months I could use the lentil press with much more success, although I’m still very cautious around that marquise shape. The first sixty hours of bead making took me about 12 weeks to reach. I didn’t feel confident enough to sell beads until a full year later and only after friends asked me. You can probably tell where I’m going with my list of tools that are essential on start up, can’t you? An assortment of marvers, my favourites are the two paddles. The one with the wooden handle has been modified into a mandrel stabiliser. The spiky thing is a vintage flower frog which is a fun marver to use. The grooved marver has become an essential tool for certain bead designs. I love my marvers. I’d say I make more than 70% of my beads with a marver and gravity only. I love them so much that I have four of them. I’ll explain why a marver should be your first “shaping” tool. Marvers are made from hardened graphite. Some have handles and look like a paddle, you can get torch mounted marvers, raised marvers and some are just a flat block. Graphite is also used to make bead, marble, paperweight, murrine and vessel shaping tools. The benchtop marver was great for laying out leaf and frit to roll my bead on, but it hurt my wrist to bend at the angle needed to do any serious shaping with. and A tiny little paddle marver. I found the little paddle marver more useful for actual shaping of a bead, but it was too small and my beads were getting bigger. So I bought a bigger paddle marver and put the little one away. Graphite paddle marvers are available in a variety of lengths and widths, some with rubber handles and some with wood. Choose one by taking note of how you work. If you keep “running out of space” you should get a longer marver. If your beads are falling off the edge, get a wider one. Although as my beads got bigger and longer I began having trouble stabilising my mandrel and my beads were losing shape because my hands shook. 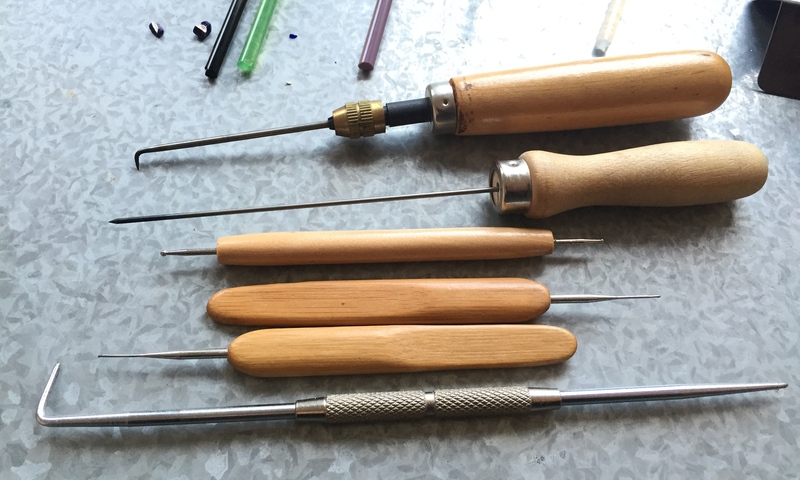 I’d read about stabilising mandrels in a glass paddle (Bhandu Durham) and that didn’t appeal, but then I recalled Jim Smirchich’s technique of modifying a marver – a tailstock (read here about a lampworker who has blogged about this specific marver). I measured a corner that matched back and front on the little marver, then cut a corner off it with the grinding wheel of my Dremel, sanded it flat, then drilled a hole in that flat corner, voila, a mandrel stabiliser. I only purchased one a few years ago and my primary reason for buying it was to keep murrini warm. I don’t do any shaping with it. Although some people find them very handy for this. I keep a small brass disc shaping tool on my torch mounted marver for easy access. There are a few “fun” marvers on the market and one you can pick up from a thrift/junk shop that will give your beads a different look. These are a good tool for beginners, you can play with texture on a bead and learn some nifty tricks with these tools. This tool leaves ridges and grooves in your bead, which can be left on it’s own or encased for some cool effects. This tool leaves circular impressions in your bead, particularly cool for organic designs. You can knock your own up by buying off-cut perforated stainless steel sheet. These flat back steel blocks have upright spikey nails embedded into them. If your roll a hot glass bead over, they will leave a whole bunch of tiny holes that you can encase for a bead filled with little decorative air bubbles. A small selection of all the tweezers I’ve accumulated. These are the ones that I use the most. I’ve bent the large paddle tweezers to make it easier to shape hearts. My basic starter kit came with a whole bunch of tweezers. Tweezers are handy for gripping the end of glass to pull a stringer or twisty. They’re also good for pinching things out of glass (such as scum or inclusions) and are useful to push, pinch and manipulate glass with. Paddle tweezers are also good for flattening out petals and leaves without making any imprints. My favourites are the smaller sizes that I use for pulling and applying stringer, pinching out designs or inclusions. It’s good to have at least one pair on hand. I went on to buy a few more different kinds of tweezers to see what I liked. Very small flat paddle tweezers can help thin the walls of disc beads (useful when making wound hollow beads. Petal Puller tweezers do what they say, they help you shape glass on the rod to create petals for dimensional work. These are handy for creating square beads. I modified my pair by carefully bending back the arms to form a V which helps to form the base of free-form heart shaped beads. Standard (snub nose) tweezers come in two styles, ridged grips and smooth grips. Smooth ends are slipperier (I’ve sometimes lose grip on the edge of a stringer) but because they don’t leave an impression in glass are useful for manipulating sculptural designs. Cross Lock tweezers are mostly used in bead knotting as the tweezers lock into place and can slide a knot down nicely. They can also be useful for getting a strong hold on Murrini. I find that they’re very useful for pulling out inclusions from glass rods as the lock means you can heat and pull in one motion. Tungsten Pick tweezers have the added bonus of not heating up easily, and having really pointed ends that are useful for poking holes and dragging glass into designs. Lastly, consider a pair of pliers with spring form handles (you can get a lot of different kinds). Whilst they’re not exactly a pair of tweezers they perform the same function and you can save yourself money by raiding the toolbox. Another useful shaping and design tool is a knife or blade edge, like a razor tool. These come in a huge range of types. From your every day stainless steel knifes picked up in a variety/junk shop to specialised brass tools that are so expensive you will scream like a banshee when significant other “borrows” them for a purpose not intended and ruins the edge. (True story, I haven’t forgiven him. Keep expensive tools away from thieving handymen). Various blades, dental tools, Corina’s Magic wand, Sharon Shaper and large flat spoon thing that I found in a junk shop. The second shaping tool with an edge is a stump shaper, whilst not as sharp as a knife or a blade these tools have a handle and a blunt edge that can be used for shaping, they come in all different widths, dimensions and styles. Tungsten Poker and rake at the top, a paper embosser, two tiny crochet hooks and a stainless steel poke and rake. I really like found tools for poking and raking. I use them just as much as the Tungsten tools. Pokers and rakes are mostly made from Tungsten because these tools are used in glass when it is very hot and soft. Tungsten can absorb a lot of heat and cools down quickly, which means it doesn’t stick to glass easily. You can get stainless steel pokes and rakes, but you will need to chill them after prolonged use as stainless steel sticks to glass when it’s hot. These tools are primarily used for design purposes, such as poking holes for trapped air bubbles and raking dots and lines for effects. Poker: A long thin rod with a sharpened end and a wooden handle. Does exactly what it is named for. Use it to poke holes in dots then slather a transparent glass on top to trap an air bubble for a pretty design. Can also be used as a rake to drag or push dots and lines around. This is the only pair of mashers I have and I don’t use them very much because I don’t like how they squeeze glass. I’m not sure why these were popular as some made an absolute hash out of your bead. BBQ mashers were everywhere about ten years back. I think tab style presses have largely relegated this tool to the storage cupboard. They basically mash your bead flat. The BBQ and Tweezer style presses by their very design mean there is a lot of fiddling to get a perfectly flat bead. Parallel Mashers are much better to use if you want a flattened bead. I’ve never bought a pair of these, as I flatten my beads between my paddle marver and my bench marver. Parallel mashers give a more even finish though. There is a comprehensive review here of TP Mashers, probably the best parallel mashers around. 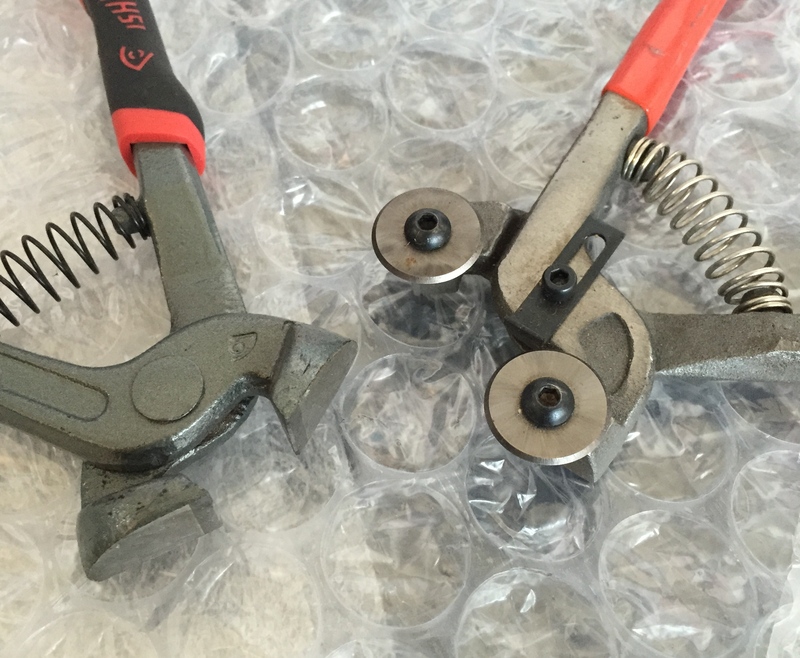 Tile Nippers (left) Mosaic Glass Cutters (right). I find the nippers much more useful and easier to use. However the wheel cutters are useful for 8mm and larger rods. …and those are the best tools you can purchase for the first 60 hours on your torch. Now what to do? I highly recommend doing Heather Trimlett’s 40 bead challenge. A specialised mandrel toolmaker known as “Inspirational Toolworks” now sells through Zoozii’s. Some of your local suppliers will stock tools by these companies, also try Etsy and eBay for these tools as many of these suppliers sell through there or you can pick up second hand ones. 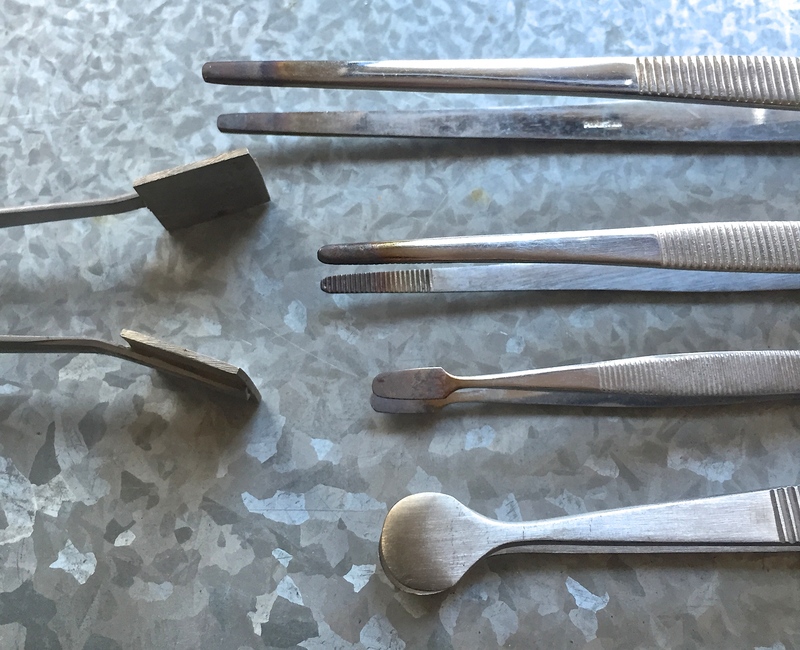 When choosing a tool decide what it will be for, shaping or moving glass? 1. Graphite is slippery, glass will slip over the surface of it. Its useful for shaping the base bead shape. 2. Metal is grippy, glass will grip to the surface of a metal marver. Its useful for dragging glass across the surface of a bead. (Brass tools are handy for smoothing encasements without distorting the base bead). 3. A bead roller or forming tray uses gentle heat and a spinning motion to shape the bead, because these tools are graphite the bead will slide across the surface and get a nice smooth finish (if you are using the correct amount of glass in the tool). 4. Brass presses push and mould glass into shape, the press will leave distinctive “chill” marks or ripples and the bead has to be reheated to gently smooth them out. Most marvers are made of either brass or graphite. 1. Graphite heats up quickly and holds heat for a long time if used continually, although a cold graphite marver will chill your bead. 2. Brass heats up quickly but does not hold heat as easily as graphite, brass really chills beads. Although brass can stick to glass if you’re not being careful to space your working time out with a particular tool (like a small brass poke). 3. You will need to slowly roll heat through your bead at the top of your flame to make sure your bead hasn’t chilled all the way through (which will cause it to crack in half). 4. You can keep a jar of water next to you and a cloth to “cool” your small brass tools down.